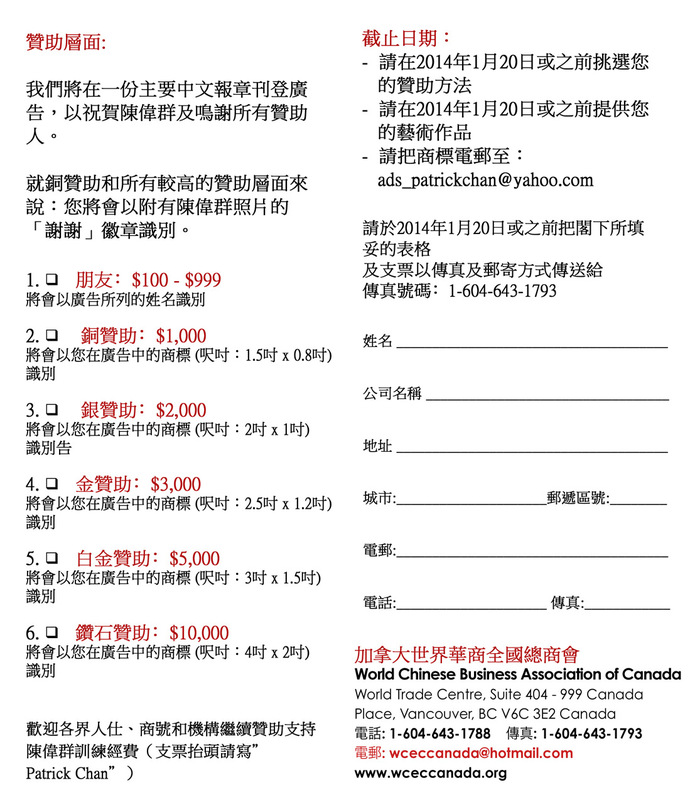 "Our Association is created and being developed by the Founders of 4th World Chinese Entrepreneurs Convention, in Canada 1997, and Founding Directors of the Chinese Entrepreneurs Society of Canada"
2010 World Chinese entrepreneur scholarship is now open for application, application deadline is January 21, 2011. Please come and join the Scholarship presentation and Fundraising Dinner, January 29, 2011. To continue the spirit of The 4th World Chinese Entrepreneurs Convention held in Vancouver, B.C., Canada in 1997, the Society will promote business, investment, and economic development of Canada and its global partners through networking the entrepreneurs of Chinese and other origins in Canada and around the world to contribute to the prosperity, benefit and mutual understanding of all parties involved. 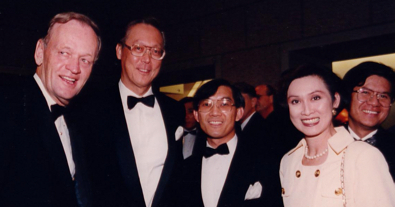 The tremendous Success of The 2nd World Chinese Entrepreneurs Convention in Hong Kong 1992 under the great leadership of Dr. Henry Fok Ying-Tung(L2) inspired Richard K. Wong(L1) to bring the Convention to Vancouver. Dr. David Lam(R2) was key note speaker and is also a major supporter of our Society. 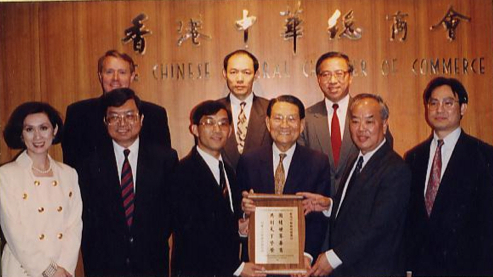 May 11, 1995, Richard K. Wong(FL3) led our bid delegation to visit the Chinese General Chamber of Commerce in Hong Kong. The Delegation was received and supported enthusiastically by vice chairmen Ip Yeuk-Lam(FR3), Ho Sai-Chu(FL2), Ian Fok(BF2) and Henry K.C. Wu(BR1). 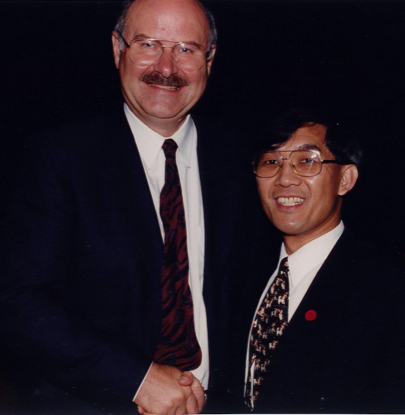 June 28, 1995, The Society, led by Founding President Mr. Richard K. Wong, celebrated the successful bidding by inviting more than 400 leaders from our community to attend the Official Announcement of The 4th World Chinese Entrepreneurs Convention to be held in Vancouver, August 25 - 28, 1997. Announcement was jointly officiated by Dr. David Lam, and Honorary Advisors: Hon. Raymond Chan, Mr. Geoffrey Lau, Mr. King Wong, Mr. Stanley Kwok, Mr. Terence Hui, Mr. Cui Pei Sheng, Mr. Thomas Fung, Mr. Milton Wong, Mr. David Ho, Mr. Ronald Shon, Mr. Douglas Jung, Ms. Eva Lee Kwok, Mr. Danny Gau, Ms. Maggie Ip, Mr. Bill Yee, Mr. James Ho and other community leaders both Chinese and Canadian. Premier of British Columbia Hon. Mike Harcourt offered his support and encouragement for the bid and celebrates the winning of the bid together. 本會榮獲 哈葛省長的支持和鼓勵,成功勇奪世界華商大會主辨權 Mr. Jim Pattison one of the most successful and outstanding entrepreneurs in Canada who has been our supporter since inception. The World Chinese Entrepreneurs Convention (WCEC) is held once every two years. The WCEC aims to draw together Chinese entrepreneurs and other interested parties from all over the world to network with each other. The WCEC is a non political, non religious, multicultural society. The WCEC allows networking and the sharing of information, traditions and cultures , allowing friendships and prosperous relationships to be developed that can benefit the greater community. 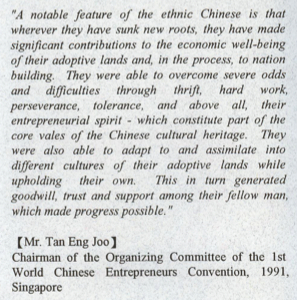 The first WCEC was held in 1991 in Singapore. The second WCEC was held in 1993 in Hong Kong. The third WCEC was held in 1995 in Bang Kok. The fourth WCEC was held in 1997 in Vancouver Canada. For the purpose of receiving the bid in Vancouver for the 1997 WCEC, Mr. Richard Wong, founding president of the Chinese Entrepreneurs Society of Canada, received Canadian Imperial Bank of Commerce's (CIBC) support in early 1995 as a corporate founding sponsor. 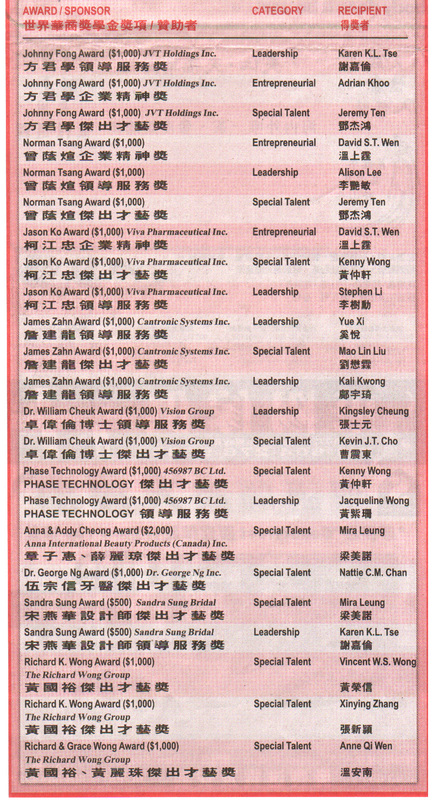 In March 1995, under the leadership of Richard Wong, along with Perry Goldsmith, Addy Cheong, and Sandra Sung forms the Chinese Entrepreneurs Society of Canada became the founding members of the society. After the society's inception, the society received additional sponsorship from Concord Pacific Development Limited, BC Trade Council, Canadian Airlines, and Mutual Group Insurance Company. All three levels of Canadian government, Singapore Chinese Chamber of Commerce and Industry, Hong Kong Chinese General Chamber of Commerce, Thailand Thai-Chinese Chamber of Commerce, past lieutenant governor of BC Dr. David Lam, past Canadian Prime Minister Hon. Jean Chretien, past BC premier Hon. Mike Harcourt, Singapore prime minister Mr. Li Kwang Yue, Mr. Tan Eng Joo, Hong Kong Dr. Fok Ying Tung, Thailand Dr. Zhang Ming Yu, past Secretary of State for Asia Pacific Mr. Raymond Chan are supporters. Honorary chairman of the Chinese community society Mr. King Wong, Mr. Geoffrey Lau, Mr. Terrence Hui, Mr. Stanley Kwok, Mr. Thomas Fung, Mr. Milton Wong, Mr. David Ho, Mr. Cui Pei Sheng, Mr. James Ho, Mr. Bill Yee, Ms. Eva Lee Kwok, Mr. Danny Gau, Mr. Ronald Shon, and Mr. Douglas Jung act as honourable advisors. 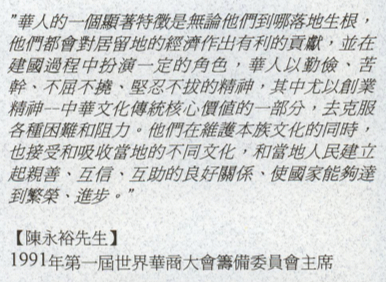 Both Chinese and Western business associations, the community service association, SUCCESS, and many business leaders supported Mr. Richard Wong who organized and successfully led the bid team in May 1995 to win the 1997 bid for the 4th WCEC. In June 28, 1995, an unprecedented press conference held at a hotel in Vancouver announced that the 4th WCEC will be held in Vancouver. It was then decided that the WCEC will be held from August 25 1997 – August 28 1997 at the Trade and Convention Centre. After successfully obtaining the bid rights, many business leaders around the Vancouver community were very excited. Not only can the WCEC attract a large number of overseas Chinese Entrepreneurs to Vancouver for these benefits: tourism, investments, the development of small to mid sized businesses, the expansion of overseas markets and opportunities, the increase in job opportunities and the increase in the status of Chinese Entrepreneurs, it can also develop the synergies between the Chinese Entrepreneurs and the Caucasian businessman as they work together jointly on this project. It can also unite Vancouver and the entire Canada's Chinese Entrepreneurs, business and community associations to become a powerful force. 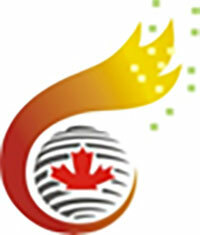 This force can help contribute to the Canadian Chinese business people and other nationalities in the world. For the success of this convention, Mr. Richard Wong, along with the founding members of the 4th WCEC (The founding directors of the Canadian Entrepreneurs Society of Canada), in November 1995 invited passionate business entrepreneurs into the society. Nine of these entrepreneurs became the 2nd term directors of the society, thus, at the same time; the four founding directors stepped down their posts. 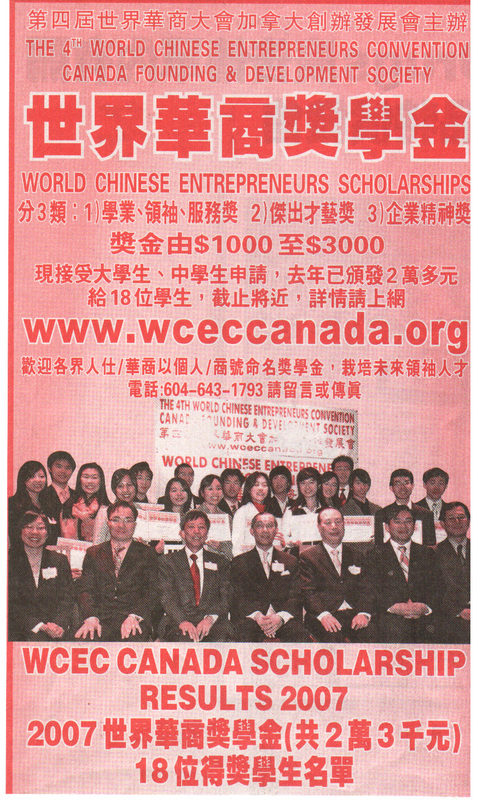 in October 1996, after the initiation of the nine new directors for the second term of the Chinese Entrepreneurs Society of Canada, the rights for the 4th WCEC bid was given to a new organization: The Fourth World Chinese Entrepreneurs Convention Society. Thus, the organization to officially hold and organize the 4th WCEC is The Fourth World Chinese Entrepreneurs Convention Society. This new society's directors include Dr. David Lam, Dr. Milton Wong, etc. Under these directors's leadership, with the assistance of Mr. King Wong, Mr. Howard Ho etc., the 4th WCEC was successfully held. In hopes that the spirit of the 4th WCEC will continue to prosper, the founding members of the Chinese Entrepreneurs Society of Canada established The 4th World Chinese Entrepreneurs Convention Canada Founding and Development Society. The purpose of this society is to receive the flame and the legacy that is left for them and to preserve and further the passion of the 4th WCEC. To do such, the society will host business events and activities in hopes to unite the Chinese entrepreneurs, and different business and community associations in Canada. This is for the purpose of successfully contributing to Vancouver, Canada, and the greater Chinese business entrepreneurs all over the world in these areas: commerce, investments, and economic development. The president and chairman, Mr. Richard Wong, Vice Presidents Mr. Addy Cheong and Ms. Sandra Sung, and honourable advisor Mr. Perry Goldsmith. Patrick Chan is the reigning Figure Skating National Champion of Canada (2008 – 2010). Patrick, just turned 20 on Dec 31st, is a descent of Hong Kong immigrants. Patrick is a diligent and energetic youth who is planning to attend university in the coming fall. In the coming March 2011 ISU Figure Skating World Championships, Patrick will again show his stylish and powerful skating technique in Tokyo. It is widely expected that Patrick Chan would poise to a Gold medal finish at this event. During the recent two years, in the international stage, Patrick Chan had already won a Gold medal at Four Continents Championships 2009 held in Vancouver; and two times consecutively the Silver medal in 2009 and 2010 ISU Figure Skating World Championships held in Los Angeles, USA and Turin of Italy. Patrick Chan had even become the second youngest medallist ever in the FS World Championships history. At the 2010 Vancouver Olympic, Patrick gained 5th at the Men's Figure Skating competition. In the ISU Grand Prix 2010 season, Patrick won a Gold medal in Skate Canada, and then a Silver medal in Cup of Russia. Subsequently on December 11, 2010 at the Grand Prix Final held in Beijing, China, Patrick performed to a season best in the Men's field (score of 259.75), and won the champion to wrap up this international competition. In the forthcoming future, Chinese communities across Canada would put up a strong faith behind Patrick Chan, as well as engaging and wishing him the success in representing Canada to challenge the Gold medal of Figure Skating World Championships and even compete again at the Winter Olympic in 2014 to win a medal for the country.